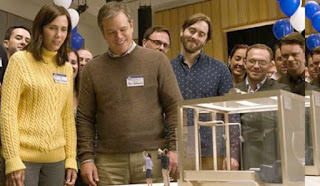 A middle-class couple (Matt Damon, Kristen Wiig), at a financial dead-end, hear of a new process by which people can be shrunk to a height of five inches, making the cost of living tremendously cheap; for instance, a house that is the equivalent of 12,000 square feet is no bigger than a doll’s house. 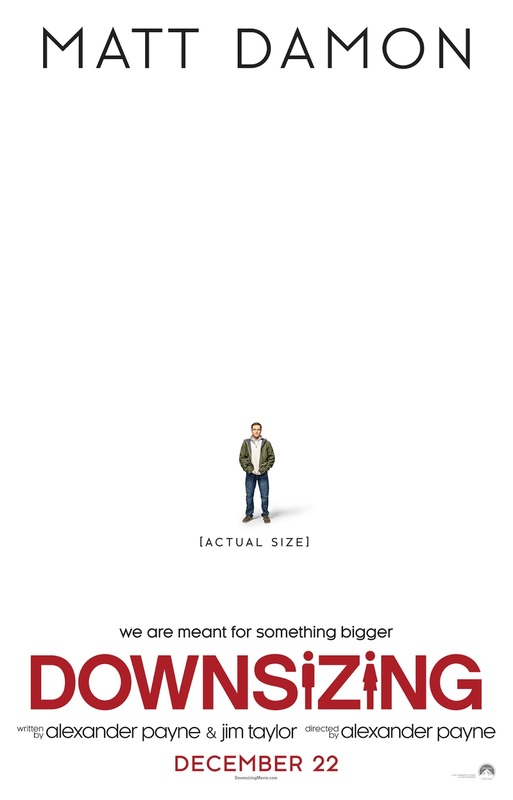 They decide to undergo the process, called ‘downsizing’, which takes them on a new and unexpected path in life. Downsizing started out with a great deal of promise. The potential for such an imaginative premise is almost limitless. 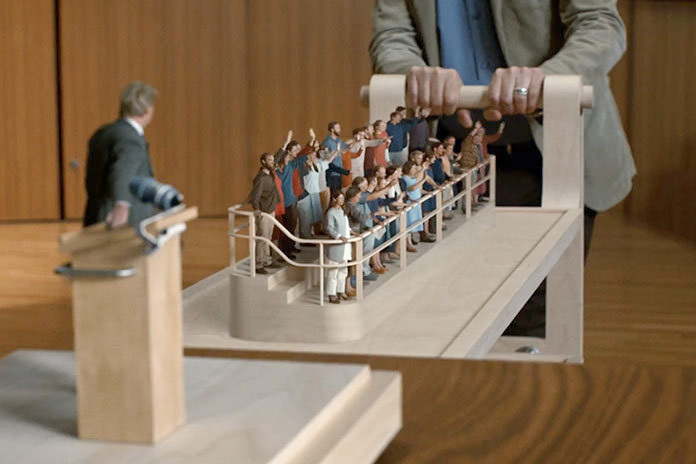 After the first fifteen minutes, I was expecting a social satire: it could explore the rights of the ‘small’ community, the problems with every-day living, their relations with normal-sized people. Instead, it goes nowhere. The original premise of the movie is abandoned and barely referred to again, after the first quarter of the film. Instead, the story switches from a nascent social satire to social commentary. We see that the ‘small’ community of Leisureland has a slum, and we see the poor people living there. Why is there a slum? We learned earlier that it costs perhaps a hundred thousand dollars to be shrunk, yet there are thousands of poor people who have undergone the process. Some, it is true, were shrunk by dictatorial governments as punishment, but this is not indicated as the case with all the individuals we see. And if an effect of ‘downsizing’ is to reduce hunger - after all, a crumb of bread is the equivalent of a loaf - why do these poor need hand-outs? Perhaps the writers wished to show that even Utopia has its disadvantaged, but this is hardly an original argument; half the episodes of Star Trek or Doctor Who make such references. At this point, we are introduced to a Vietnamese immigrant (Ngoc Lan Tran), a shrill and strident character who becomes Damon’s love interest, Wiig having been jettisoned abruptly by the movie much earlier. While the performance is excellent, the character is annoying and, much of the time, unintelligible. 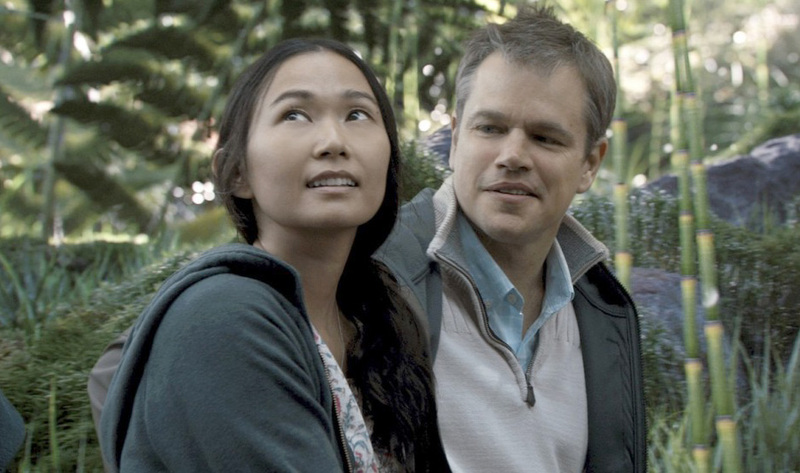 There is no chemistry between Damon and Tran, and no reason for the two characters to develop feelings for each other. Not to worry, because the social commentary portion of the film is discarded in its turn. 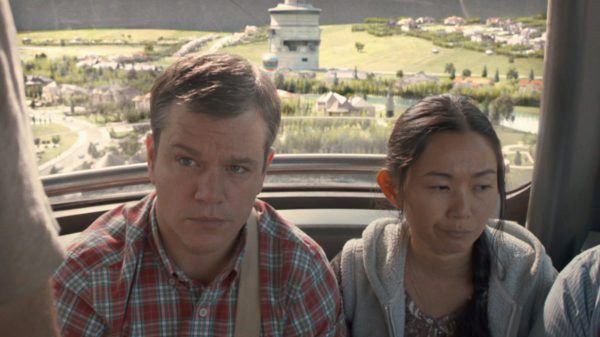 A sudden trip to Norway brings in the third plot-line, a doomsday scenario which is distantly related to ‘downsizing’, but doesn’t need it. This final part of the movie brings a revelation to Damon that the viewer didn’t know he either required or was considering. It certainly has nothing to do with anything that came before. Downsizing seems to have been made by people who had several story ideas but thought they’d get the chance for only one movie, so they put everything into it. The process of ‘downsizing’ was such fertile ground for a film that it required people of extremely limited imagination not to make something of it. How would our bodies react to food? Would alcohol and drugs have the same effect on the ‘small’ as the normal-sized? A reference early on to side-effects only in some species of fish could have been exploited. 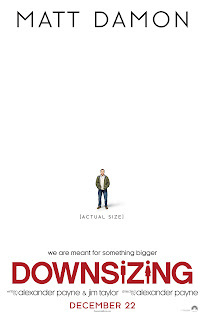 As it turns out, being ‘small’ is exactly like being normal-sized, except that one is small. It’s like a science fiction series that depicts the distant future as pretty much like now, but with ray-guns. 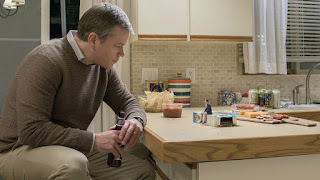 Though the writers may have believed that the disparate parts of their movie were seamlessly woven together, they are in fact disjointed stories, connected only by the same characters. 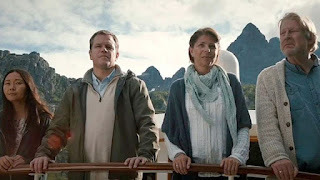 Wasted opportunities (not just in not exploring the ‘small’ world, but in putting time, effort and talent into the unoriginal and unimaginative majority of the film) make Downsizing disappointing and discouraging. Sounds like Mary Norton's "The Borrowers" did this concept first, and much better. This one wasn't even close to the imagination Norton showed. "Downsizing" was, as Polonius said, "Neither a 'Borrower' nor a better be."